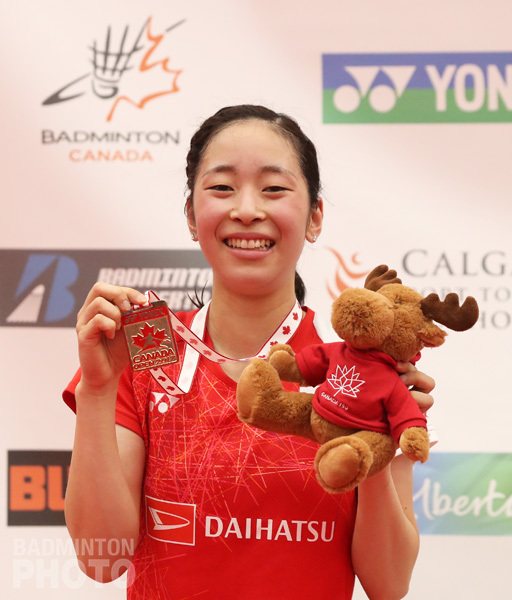 On December 12, the Nippon Badminton Association (NBA) announced its national team members for 2018, adding mostly finalists from the 2017 Canada Open. At the beginning of All Japan Championships in November, the NBA announced they would pick up about 10 male and 10 female members for the 2018 national A team, each group including 4 singles players and 3 doubles pairs. However, they added some players in as part of the Tokyo Olympic project. While results at the All Japan Championships are the key criterion for determining the A team selections, it just so happened that 5 of the 7 new faces on the most elite squad consist of Japan’s finalists in the first Grand Prix tournament of this year, the Canada Open in July. The members of the national A team are those upon whom rest the highest expectations for qualifying for the 2020 Olympics. These players will be the ones representing Japan in the highest level tournaments in the coming year, basically down to the US$350,000 ‘Level 4’ events that are essentially replacing the Superseries. 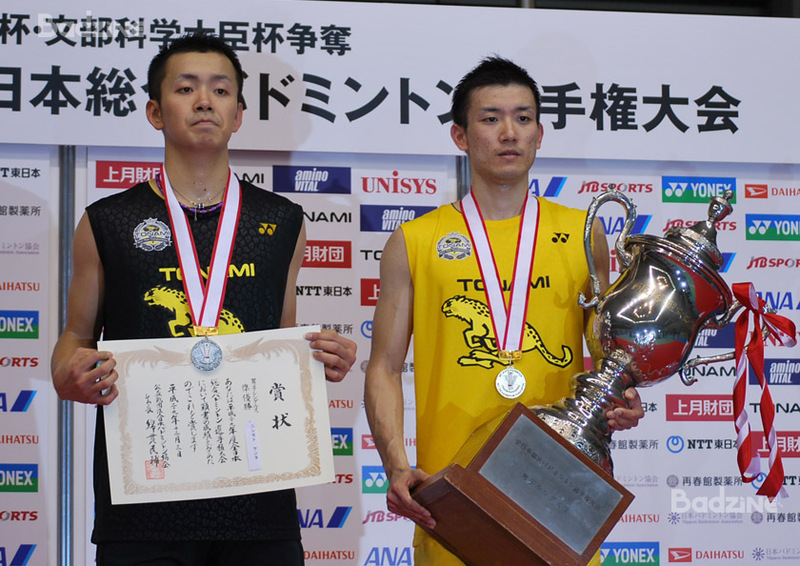 All 4 men’s singles semi-finalists from the All Japan Championships were selected, as was Macau Open winner Kento Momota. 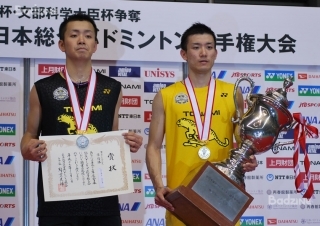 All Japan Champion Riichi Takeshita (pictured right, with All Japan runner-up Kenta Nishimoto) was one of the players who is joining the A team for the first time since 2016. The other two new faces are Kento Momota and Canada Open winner Kanta Tsuneyama (pictured top). The final in Canada was Momota’s first in over a year and it was also Tsuneyama’s best result of 2017. All 4 All Japan Championship semi-finalists in men’s doubles were also selected. In this case, the new additions were Takuto Inoue/Yuki Kaneko, who finally topped the podium this year at the U.S. Open, then reached their first Superseries final a few months later. Women’s singles also ended up with 5 members on the A team but only 3 of the All Japan semi-finalists were among them. Minatsu Mitani reached the semis and was on the A team in 2017 but she was still relegated to the B team for 2018. 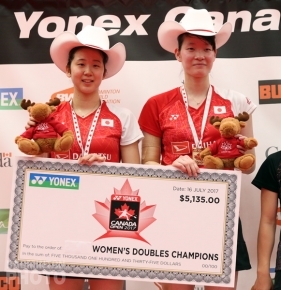 Meanwhile, current and former Canada Open champions Saena Kawakami (pictured right) and Nozomi Okuhara were selected by the result in international tournaments. In Okuhara’s case, of course, the World Championship title made up for her injury woes that kept her sidelined since the Japan Open, including missing All Japan. 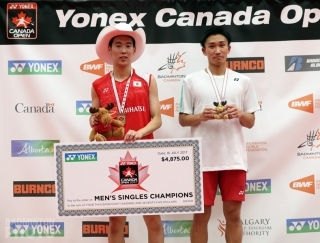 Kawakami had already picked up a Grand Prix Gold title in Taipei prior to winning in Calgary. Women’s doubles quite simply saw the top 4 pairs from the All Japan Championships selected for the A team. 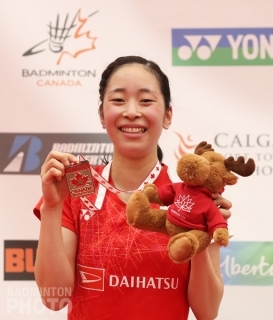 However, it just so happens that the pair that joined the three pairs from last year’s team was yet another Canada Open champion, Wakana Nagahara / Mayu Matsumoto (pictured below). Nagahara and Matsumoto have already had the chance to play in several Superseries events since September and they reached a semi-final at the French Open. Their compatriots Naoko Fukuman and Kurumi Yonao have been named to the B team for the second straight year but they have continued to play in the Superseries as dictated by BWF rules as they have spent most of this year in the world’s top 10. Mixed doubles sees some key changes. Yuta Watanabe and Arisa Higashino, winners at the All Japan Championships, were again selected and will be the focus for new mixed doubles coach Jeremy Gan, who joins the NBA coaching staff from Malaysia from next year. The NBA is going to have a selection camp this weekend to pick up some talented prospects from among the younger players. So far, the biggest difference compared to last year’s national squads is the absence of Japan’s top mixed pair in the world rankings, Kenta Kazuno and Ayane Kurihara. They are currently finished off their season by participating at the Superseries Finals in Dubai but they – along with men’s’ singles player Takuma Ueda – are the only players from the 2017 A team who did not play All Japan and who are on neither the A nor the B squad for 2018. Without the world #16 pair, Higashino is thus the only player named to the 2018 A team solely for mixed doubles, as her partner is also going to be counted on in a men’s pairing. I think both pairs above also a part of Team A. That is quite possibly true. Neither pair has been entered in the first big events in Thailand, Malaysia, Indonesia, or India but they may be yet. This doesn’t contradict the article, however. What it says is that only Higashino has been named to the A team based on mixed doubles. Hoki, Hirota, Kobayashi, Matsutomo, and even Higashino’s partner Watanabe are all members of top pairs in level doubles who reached the semi-finals of the All Japan tournament and are thus on the A team and available for mixed duty as well. The pairings were not decided upon at the time of writing and that was a little different from 2016, when Higashino, Kazuno, and Kurihara were all named to the A team just to play mixed doubles. I don’t think NBA published the separated category list in mentioning Team A and/or team B. NBA choose the players and reconsidering to make the pairing from that list (This is what can I summarize from that). Hoki/Hirota have played 6 times in 2017, and Kobayashi/Matsutomo have played 8 times in 2017. Yeah, it’s the different thing from 2016 since at that time, none of Kazuno/Kurihara playing double duties in MD/WD. Another fact, it’s possibly the XD pair coming from Team A/Team B combination. e.g. Yuki Kaneko/Koharu Yonemoto (entering Indonesia Masters 2018). The fact that 2018 year is men’s and women’s team championships calendar within Thomas & Uber Cup as the highest team event of the year, also contributing factor which makes the XD pair priority become lower than ever. It is correct that you don’t have a whole pair of mixed players who won’t do double duty. However, Higashino has still been named to the A team solely to play mixed. As for the A/B team competition, it is possible. Kaneko was technically still only a B team player at the time of the Indonesia Masters deadline, but he and Inoue were already in the top ten and the Jeremy Gan may have been confident that Kaneko would be on the A team by the time the tournament came around. On the Thursday night, though, the coaches would still have had no idea who would make the cut based purely on the All Japan results. The Indonesia entry deadline came before even the quarter-finals in Japan. Interestingly, Kaneko and Yonemoto only played 3 tournaments in 2017, since Kaneko was playing only in B team events like GP, GPG, and nearby SS, no SSP, while Yonemoto was playing in the top-flight events. Indonesia Masters Entry Deadline is Dec 12, 2017 and Malaysia Masters Entry Deadline is Dec 05, 2017. Both of the deadline dates are even after The 71st All Japan Championships Final concluded on Dec 03, 2017. Indonesia Masters Entry Deadline is closely after NBA published the 2018 National Team member (Dec 12, 2017). Thank you for the correction. I had the weeks completely confused. So that could mean there was no impediment to entering Kaneko and Yonemoto in a Level 4 event. Both had already qualified to be a part of the national A team. It will be interesting to see what happens with Japanese mixed pairs this year. You may be right about the prioritizing in a Thomas & Uber Cup year. Then again, they also have a new coach. I hope to see more from Watanabe and Higashino in particular. Would Kazuno san and Kurihara san still be entered by NBA in or above level 4 tournaments? It’s a pity that they strictly follow “All Japan c’ships” results for choosing national teams when it comes to doubles discipline. They’re quite pliable regarding singles, or else Mitani san would be in A-team. It’d have been better if they chose players for teams, based solely on how they fared this season. There would be lesser exceptions then. In contrast to significant number of exceptions, I reckon, there would be only one, then. And that’s Momota san. Correct me if I’ve analysed it erroneously. I believe Kazuno is retired. And Kurihara is on her way out.